Not sure you can make money doing what you love? You can! Even if you want to start a service based business. First if you haven’t read Part 1 – check it out! There is a way to combine your talents into a business model that pays. Check out the two tips below. If you are in a rut, schedule some brainstorming time. Even if you have enough of these lists to wall paper your house, you might want to consider a refined test like the Strengths Finders test (which can really highlight your true strengths) or How to Fascinate (a new tool that I found thanks to Marie Forleo that hones in how others currently perceive you). Btw this is a great way to start collecting testimonials and recommendations that you can post about your business on your website!! What do your employers always count on you for? Outside of your traditional job description. What are you always to do with ease…what no one else can do? Write it all your ideas down. 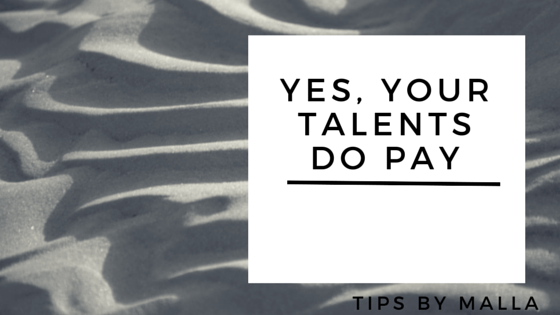 And then list each talent on a Post-In Note. Now create another list. This time you’ll use more of your rational or left side brain thinking to come up with a list of all of the ways that you solve customers needs based on business ideas that you’ve had or have. Go all out and create a list of ideas that sound interesting…and those that don’t sound interesting but you believe would earn you decent money. You’ve got to show up 100% in your business if you really want to have something that inspires you long term. Otherwise, you’ll get frustrated when trends shift, you’ll start complaining when it doesn’t move past a certain income level, or just flat out bored. If you’ve ever had a job that you did well but hated, you can COMPLETELY relate with this idea. So I recommend that you get a blank wall and start brainstorming how you can combine all three ideas. You can do this to help you narrow down the business idea that you want to start OR you can revamp an existing business that doesn’t quite fit you – ie. too much of what you think customers want and not enough of you. Take your list of talents and list of business ideas and line them up side by side. Start swapping the ideas that you like the best and are more strongly linked to on the top. And then start playing around with the answers you get. Or if you love writing and have been working in the medical field for a number of years – you could start providing content for doctors who are too busy to keep up their blogs. There are literally 1000s of ideas that you can create. Play around with these ideas, come up with your top three…and then reach out to a coach, mentor or small business advisor to get their thoughts on your results. Or better yet – START SELLING. Yup. Find a way to start selling and the market will tell you pretty quickly if you have a winner.